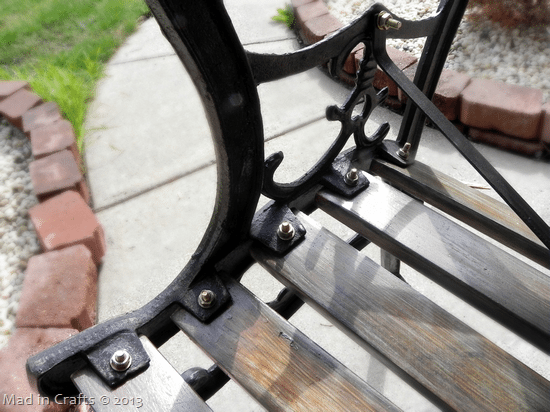 A few weeks back, I asked you here on the blog and on the Mad in Crafts facebook page what I should do with the beat-up park bench that was sitting on our front porch. One thing is for certain, you aren’t afraid of color! I hope I don’t disappoint you too much with my final decision! I did add color to the bench, but I wanted to make sure it still blended in with the traditional colors and style that The Mad House already had. 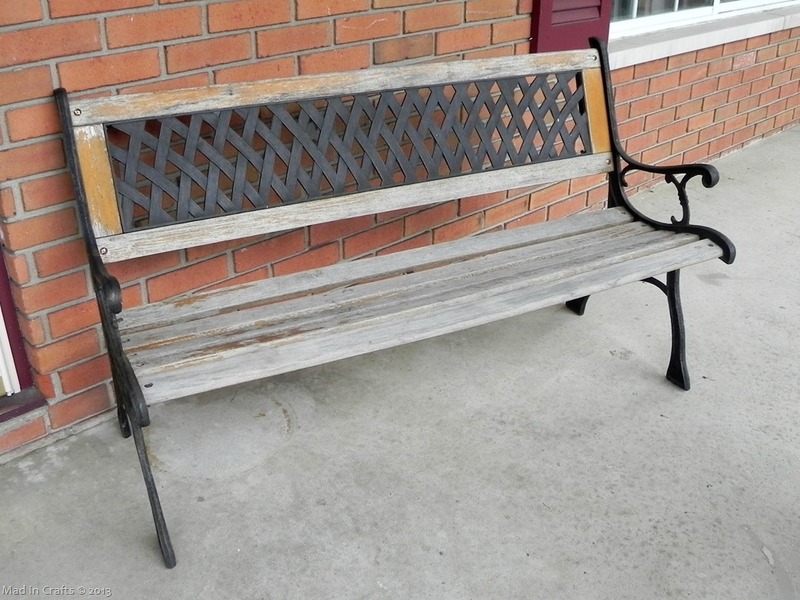 After some researching and shopping, I ended up restoring the bench with a colored stain and some poly. Exposure to the Midwest elements had already done most of the finish stripping already, so I just had to take the bench apart and sand down the areas where the poly and stain were still clinging desperately to the wood. 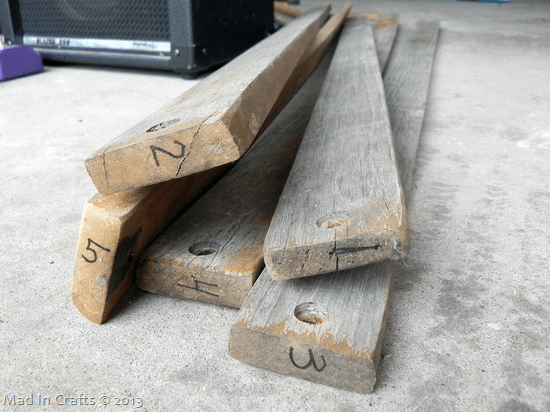 As I took the slats off of bench, I numbered them from back to front. Numbering them on the very end made re-assembling the bench much easier and, once the bench was put together, the numbers aren’t visible. 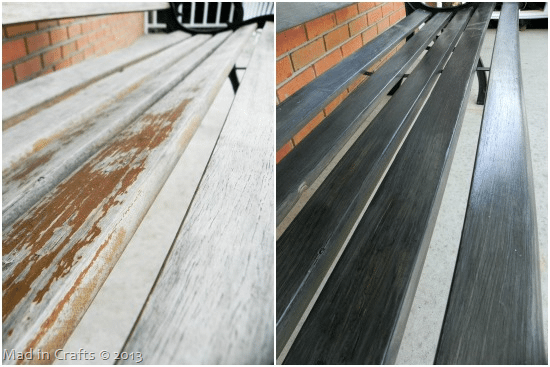 After the slats were sanded down, it was just a matter of giving them several coats of tinted stain and a good coat of polyurethane. I used Behr’s tintable semi-transparent Weather Proofing stain in Atlantic to color the wood. 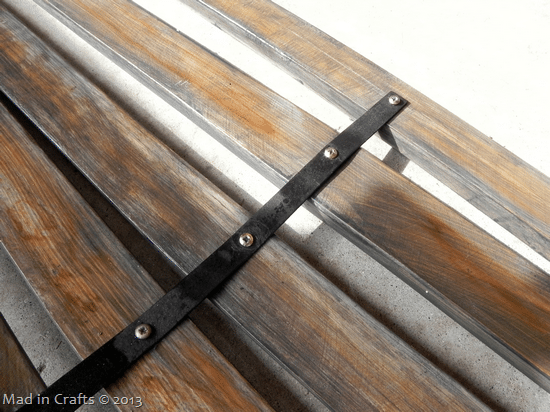 I like that it added a weathered, blue color to the slats but the product is meant to protect the wood from the elements. In other words, I got a weathered look without actually weathering it. 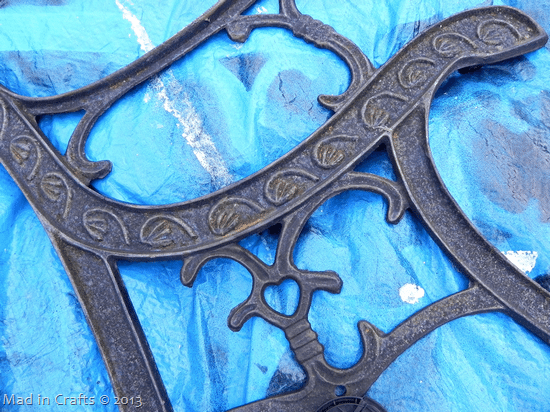 The wrought iron arm pieces were beginning to show signs of rust, so I sprayed them with a few coats of Krylon’s Rust Protector spray paint in Oil Rubbed Bronze. Again, the product keeps the original look of the metal but protects it from the weather. After everything had dried and cured, it was just a matter of putting the seat back together, using my numbered slats as a guide. 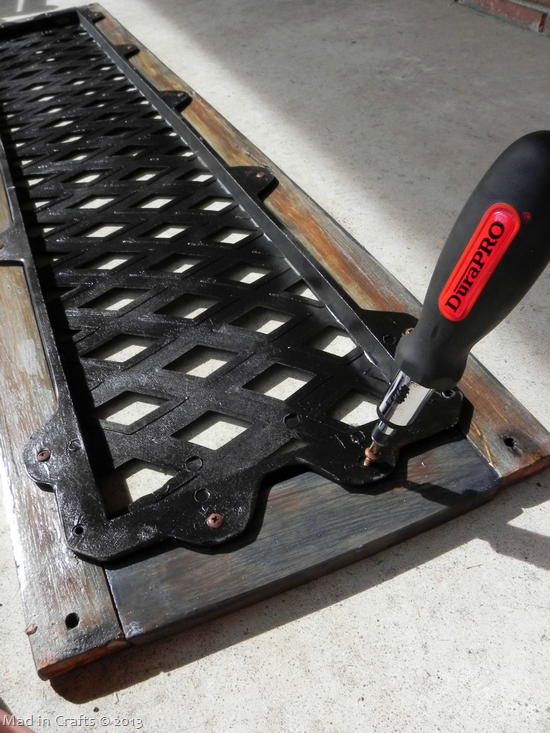 As far as DIY projects go, this is a fairly straightforward one. 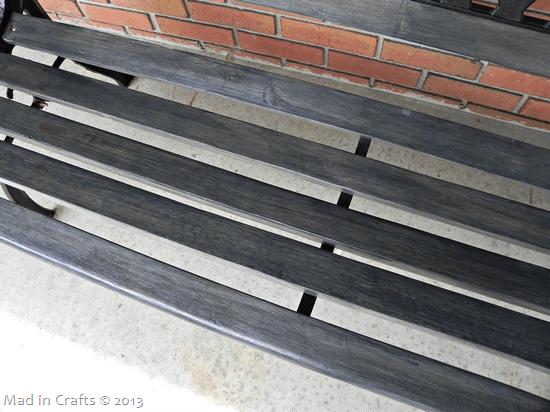 It takes a little time because you have to wait for each coat of stain and poly to dry, but if you have assembled IKEA furniture successfully, you can redo a bench like this. 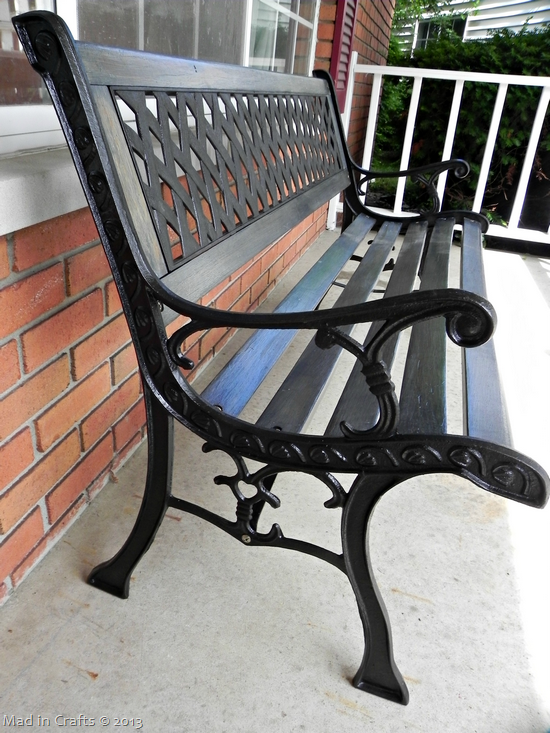 My refinished bench isn’t technicolor, but I think the weathered blue-grey looks smashing. It looks like it was always meant to be that color. I am really excited about how the tinted stain worked out. I hope I can find more uses for colorful wood stain because I’d like to try out some of the other colors. My trusty ORB spray paint looks as gorgeous as it always does. Plus, if we ever move this bench to the back patio, it will look like it matches with the Craigslist Patio set I redid last summer. Mostly I am glad that the bench is protected enough from the elements now that we should be able to get a few more years use out of it. 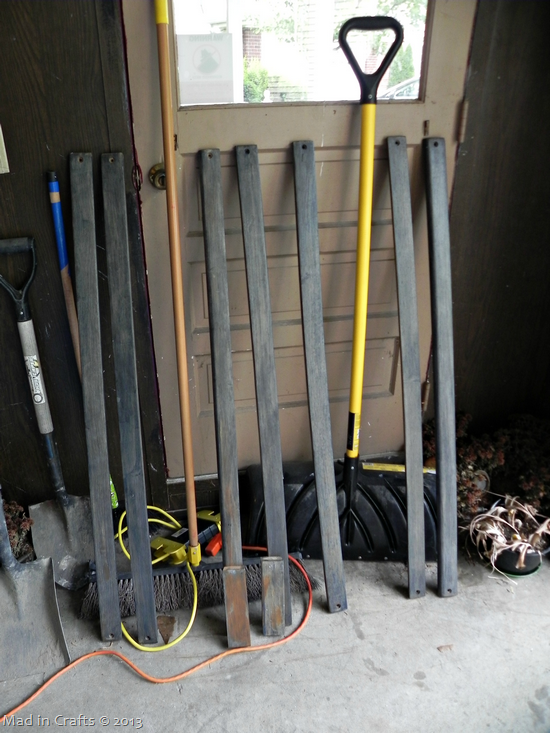 I am not sure how much longer those slats would have lasted if I hadn’t weather proofed them. 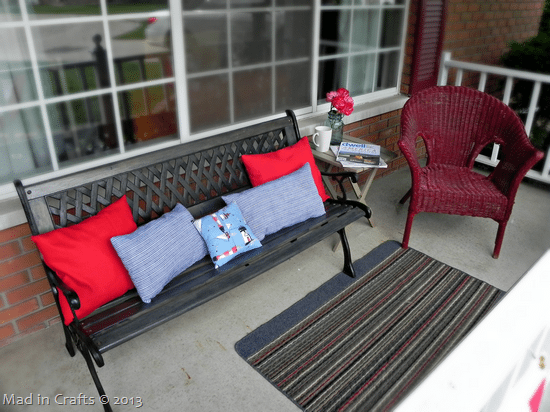 I dug through my stash of fabric and made some quick pillows to decorate the bench and tie in with the rest of the red, white, and blue porch update. 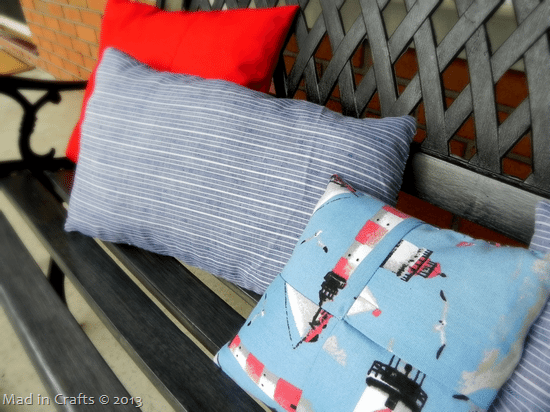 The pillows are stuffed with plastic grocery bags, to make them as outdoor-friendly as possible. The bench update might be a little underwhelming on the bold color front, but I think it is just right for our needs. Are you mad at me for not painting it fuchsia? Be honest. 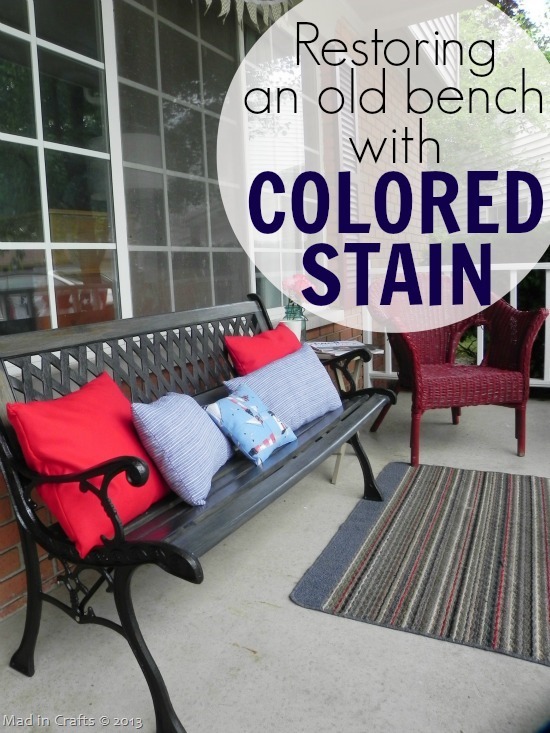 How much stain did you use on the bench? It\’s been a few years, so I am not sure if I got a pint or a quart, but I remember that it didn\’t take much. 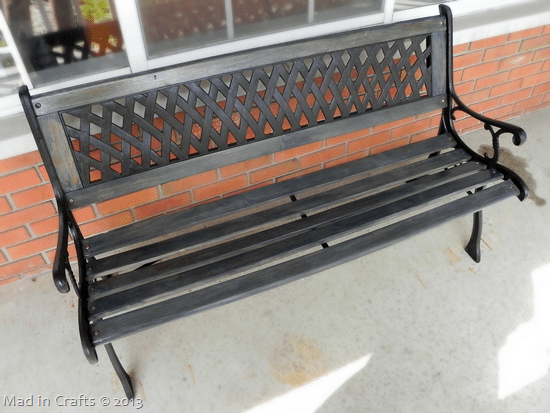 I just re-finished an identical park bench the wife and I inherited from our home purchase. 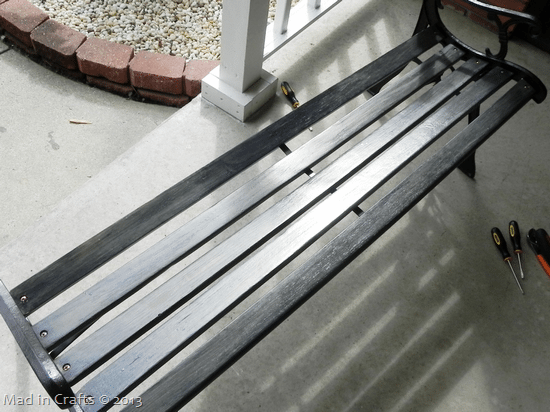 I used Douglas Fir stained with a traditional cherry stain and a few coats of polyurethane – satin black on the iron elements. I noticed you added braces to the bottom of your slats and cross support to the legs. What did you use for that? Great project – great minds think alike! I didn’t add anything to my bench that wasn’t already there, so the supports must have been added by a previous owner. Your bench sounds beautiful!